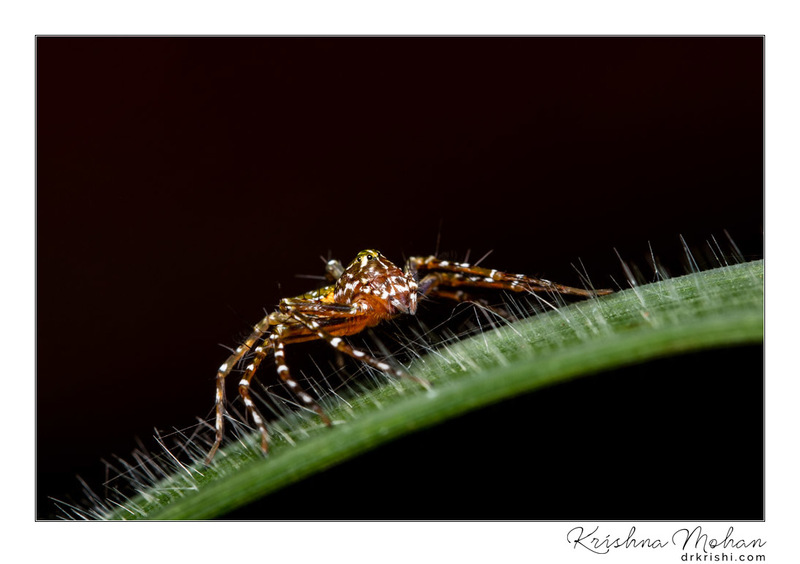 I found this Hamadruas spider in my garden waiting for the prey. 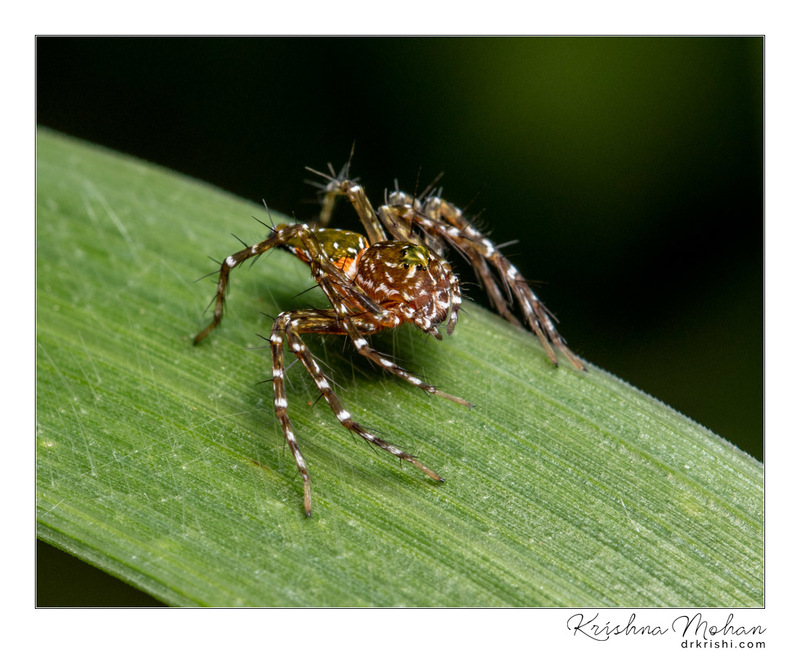 Hamadruas is a genus of lynx spider family Oxyopidae with Indo-Malayan distribution. 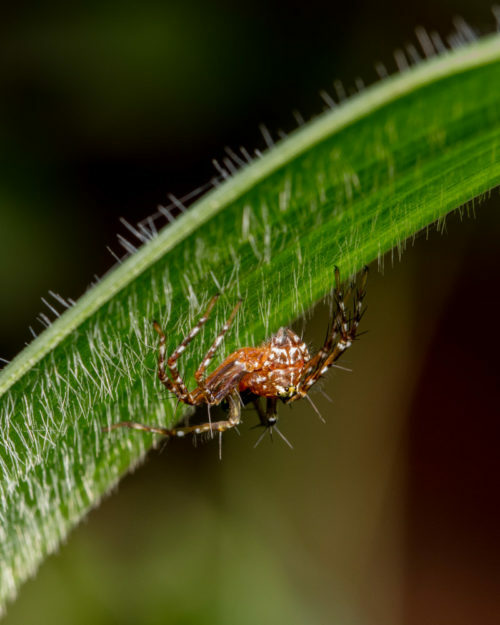 Most Lynx spider species make little use of webs, instead spending their lives as hunting spiders on plants. Many species frequent flowers in particular, ambushing pollinators. I used Canon EOS 5DS R with Canon EF 100mm f/2.8L Macro IS USM illuminated by Godox Ving V860C II E-TTL Li-ion Camera Flash fitted with LumiQuest SoftBox III to capture this beauty. 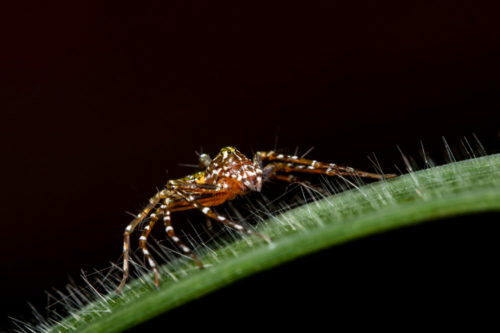 Typical of most Lynx Spiders, Hamadruas spiders do not spin webs for catching prey, instead, they wait for their prey motionlessly and pounce upon it as soon as it comes within their close range. Hamadruas species was observed taking care of its young ones. 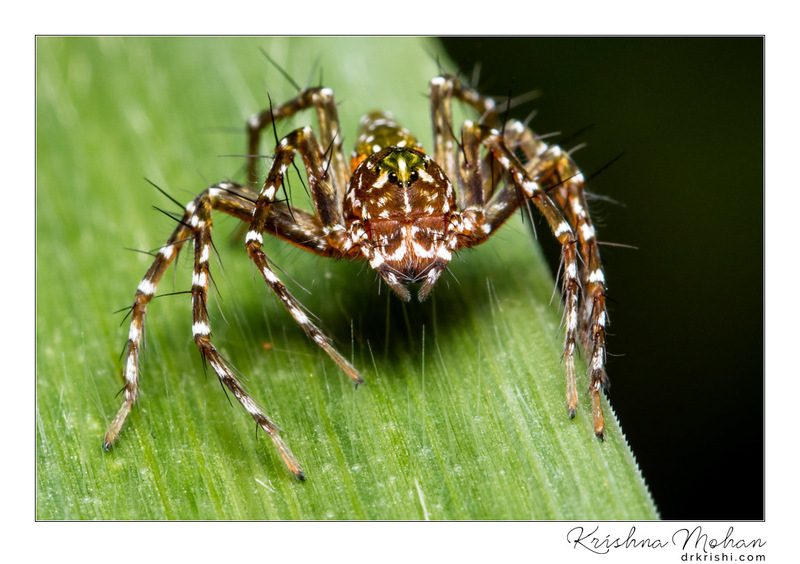 The female builds an egg sac which she sticks onto a dry leaf and also toughens it by adding subsequent layers of silk. The outer layer of silk appears pinkish in daylight. The female guards the egg sac by sitting above it. The body of the female which is dark green with brown and white patches camouflages well in its surroundings. 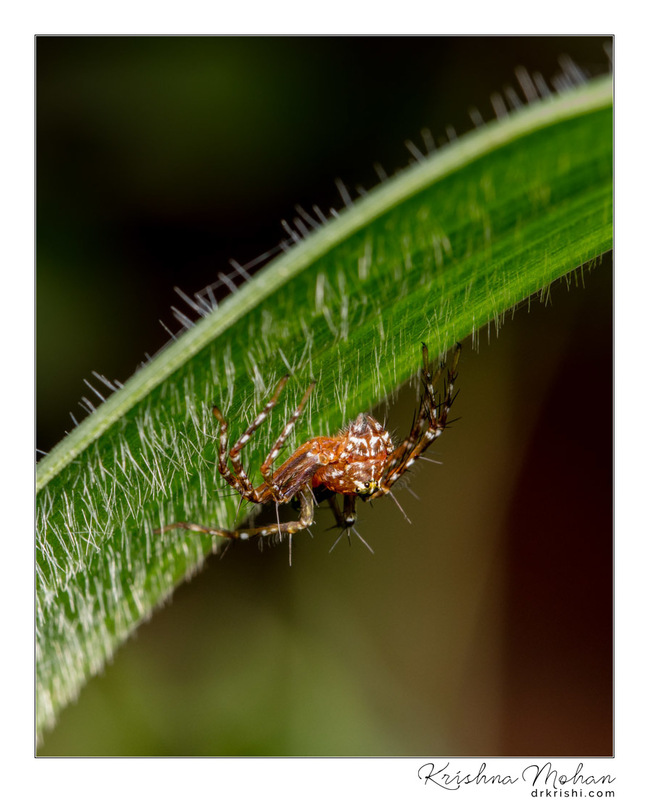 Even after the hatching of the egg sac, the female accompanies the spiderlings until they are ready to disperse. Hamadryas’ name means Together-with-Tree and Together-with-Oak from the Greek words Hama and drys –the latter being both holm oak and generic tree. In Greek mythology, Hamadryas was a tree-nymph of Mount Othrys in Malis (central Greece). She was the daughter of Oreios Of the Mountain, wife of Oxylos Of the Forests, and mother of eight Hamadryades who each presided over a specific type of tree. Hamadruas genus can be diagnosed as follows. 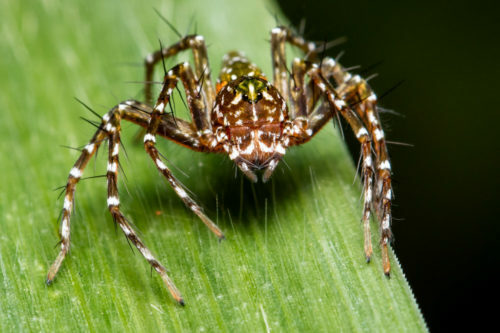 They are large spiders, 7-15 mm, females usually larger than males. 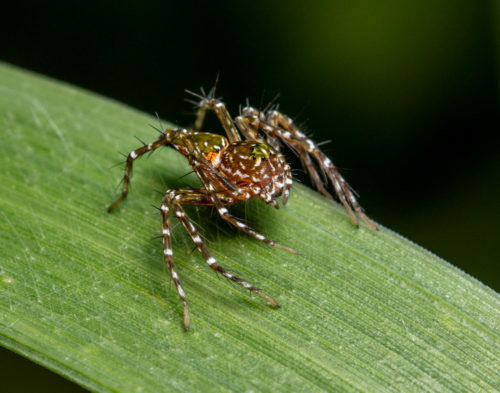 The abdomen dorsally often has a species-specific geometric colour pattern. Species in this genus are distinguished by the carapace being lower, the head having straight sides sinuating to the thorax instead of regularly convex as in Hamataliwa and Tapponia. The head width is 25% less than carapace width and the carapace dorsally have a shallow saddle and is higher in front than behind. The front and rear face are slightly sloping and the rear slope is shorter than front slope. in Hamataliwa the rear slope is longer than the front slope. The legs are relatively much longer than in Hawatalima, the 1st pair is longer than the 2nd which is longer than the 3rd which is longer than the 4th. The abdomen is 50-100% longer than the carapace and differently shaped from that in Tapponia and Hamataliwa. The epigyne is probably indistinguishable from that in Hamataliwa and Tapponia. The male palp is distinct by the tegular lobe in which the spermaphore loops around, crossing itself around a pit and by the presence of a flange on the basal part of the embolus. 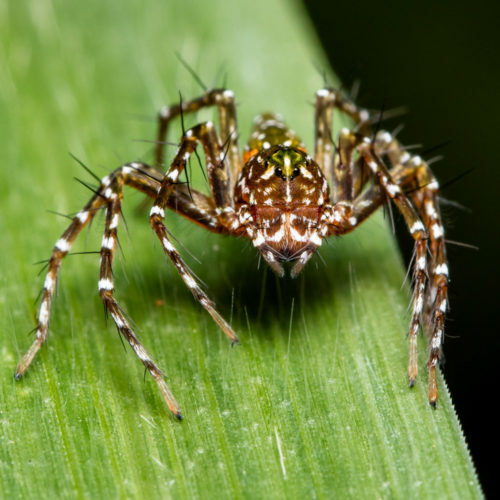 The surface of the abdomen is green in life, with a pattern of brown and white pigment causing for the colours, as opposed to Hamataliwa, where all colour is affected by non-iridescent setae, white, dark or rusty red. Distinguishing between the species of Hamadruas is easiest by the abdominal pattern; in males by the shape of the embolus tip, the shape of conductor and embolus and the distal chitin bulge on the RTA, females by the size, shape and structure of the epigyne. 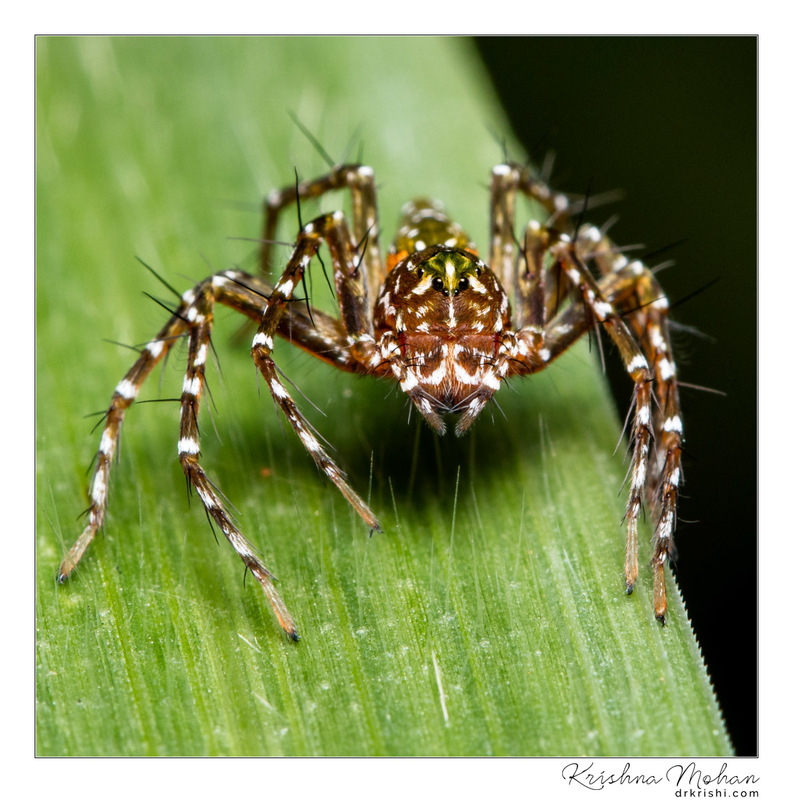 At present this spider is known from Burma, Thailand, Malaysia, Borneo, Indonesia (Sumatra, Lombok), India and China.